Group exercise is one of the very best routes to getting active, improving your physical and mental wellbeing and realising an all-round healthier lifestyle. Indeed, it is only through a sensible diet and regular physical activity that the human body will achieve fitness, and, subsequently, the many health benefits that come with it. However, instead of making the commitment to improve health through long-term changes in eating and exercise habits, many people are tempted by the quick-fix promises of fad diets. Fad diets are everywhere. Invariably marketed as quick ways to lose weight, a new diet craze seems to spring up almost every week – from low-carb diets to low-fat diets, alkaline diets, and even werewolf diets where you’re encouraged to fast according to the lunar calendar. But no matter how often the most popular fad of the moment changes, the promise remains the same – follow the regime and you’ll lose weight quickly. 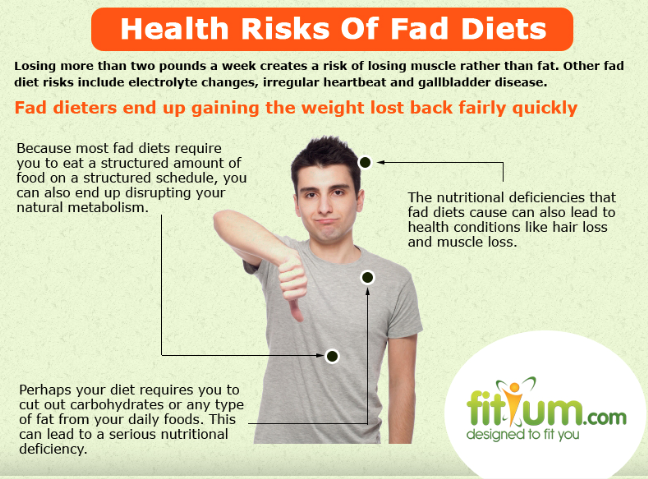 Truth be told, many people will lose weight if they follow a fad diet. However, the problem is – in the first instance – that fad diets are almost impossible to stick to in the long term. And this means that as soon as you stop adhering to your trendy new menu, it’s likely that you’ll put back on all the weight you lost – and some people in fact end up even more overweight than when they started. What’s more, fad diets often leave the body lacking in crucial vitamins and minerals – so, even if you do find the bathroom scales reveal a more pleasing number when you hop on in the mornings, this isn’t to say that you’re particularly healthier for it. Fad diets have been around for decades. They rarely work, are often detrimental to our health and wellbeing, and frequently propound the dangerous and misleading claim that adherents can lose weight and achieve a healthier lifestyle without exercising. It’s nonsense, and we all know it is. So, why do we keep falling for the false promises of fad diets? Reputed health experts have essentially been giving the same common sense advice for years – in order to lose weight and be healthy, we need to eat less and exercise more. What this essentially boils down to is the fact that the right approach to good health is to change your lifestyle – for good. However, the problem is that many people need to see results quickly, and if a fad diet promises they’ll be able to “lose ten pounds in one week” – well, that’s quite an attractive offer. What’s more, people also need to feel that the benefits of changing their habits and behaviour will outweigh the costs of the effort. We eat an extra piece of cake or slice of pizza because, in the moment, the indulgence makes us feel good. To give these moments up for evermore seems to come at a great psychological cost – in much the same way that the thought of doing regular physical exercise can seem to some people. And so we avoid these thoughts of changing our whole lifestyles and go for the “ten pounds in one week” quick fix instead, allowing ourselves to believe that the fix will last, and we can soon return to our indulgences. The truth is that exercise will always be better if you’re trying to lose weight – and for your health in general – than any fad diet. In fact, research reveals that if you’re looking to get healthy and shed a few pounds, but feel as if you can’t improve your diet – or simply don’t believe the promises that fad diet proponents make – you can exercise instead. 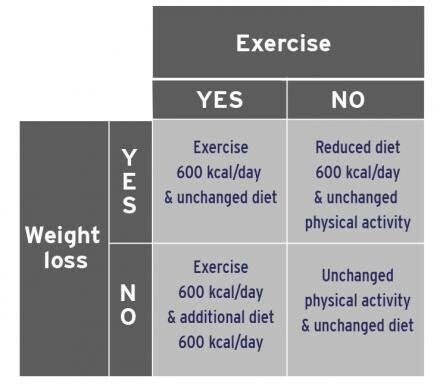 A few years ago, a group of Danish researchers conducted a controlled study of how diet and exercise affected overweight men between the ages of 20 and 40. The results were clear – not only does exercising help you lose weight far more effectively than dietary changes, but it also keeps serious diseases such as type 2 diabetes at bay. Of course, we’re not for a moment suggesting that you shouldn’t make changes to your diet if you eat unhealthy food. However, what we are saying is that in order to achieve great health benefits, you need to build physical activity into your lifestyle permanently, and group exercise is one great and fun way that you can start doing this today. Group exercise is one of the most effective ways to get fit, lose weight, relieve stress, and sustain a healthy lifestyle. From dance fitness to spinning to Boxercise – there are so many group exercise options out there that you’re certain to find one that’s right for you. As your national governing body for group exercise, a major part of our role at EMD UK is to ensure that group exercise is accessible to everyone. We work with countless organisations, local communities and leisure operators all over the country as we strive towards realising our vision of creating a healthier nation through group exercise. We of course want you to eat healthy food, and we urge you to treat the often outrageous claims made by celebrities and fad diet proponents with caution. But, more importantly, we want to help you get active and enjoy the many physical and mental benefits that participation in regular group exercise brings – and we have two great free resources that will help you find a class that’s right for you. The first is our Find a Class page on our website. Simply type in your postcode, fill out a few details, and you’ll be presented with a list of group exercise classes in your area. The second is Class Finder – the UK’s most popular, free, online site for fitness instructors and group exercise organisations to promote their classes across the web. The website currently holds information on over 34,000 fitness classes run by more than 7,000 instructors across 17,000+ venues throughout the nation. Use these free tools to find a nearby group exercise class that’s right for you, ditch the fads, and start making the long-term changes that will ultimately, help you achieve a happier and heathier lifestyle for many years to come. If you need any more help or information about group exercise classes, get in touch with EMD UK today. Hand Buoy ABCs Do You Know Their Why?